In Spring and Fall 2019, SPARK! will be held on the third Tuesday of the month, from 1–2 p.m.
To register by phone, please call (608) 256-6445, ext. 156, at least 48 hours in advance. SPARK! provides an opportunity for adults with dementia and their care partners to enjoy arts and artifacts in a comfortable setting, guided by trained docents and volunteers. Fifteen museums serving Wisconsin and Minnesota residents are extending their cultural and historical collections to create meaningful experiences for older adults experiencing dementia and memory loss, and their care partners. The SPARK! 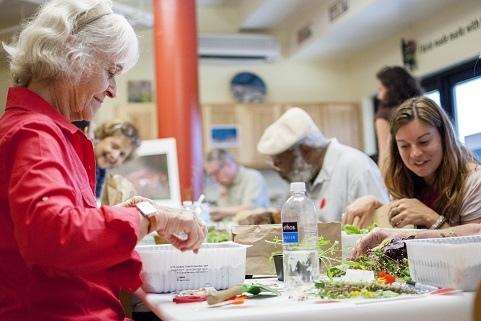 Alliance connects the museums with local partners in healthy aging to bring the model to museums, senior centers and programming organizations throughout the Midwest. As part of the SPARK! Alliance, Madison Children’s Museum hosts free bi-monthly 90-minute programs that work to tap into the memories of adults living with Alzheimer’s and dementia while bringing family together. Between July 2015 and June 2016, SPARK! provided 26 cultural programs to 287 adults with Alzheimer’s disease and other types of memory loss.